It is the object of the following paper, to describe those insects of Eastern New York, which occur in their perfect state in the winter, and are peculiar to that season and the early part of spring. They are objects of curiosity, as coming forth to our view in full maturity and vigor, at that time of year when almost every other member of the animal and vegetable kingdoms is reposing in torpidity under the chilling influence of the solstitial cold. In an economical aspect, they possess but little importance, their period of life being limited to that season when the field furnishes no herbage, the garden no flowers, and the orchard no fruits, on which they can prey. They are chiefly interesting, therefore, merely as objects of scientific research – as forming integral parts of that vast array of animated beings, with which the Father of Life has populated our world, and rendered it vocal with his praise. What better way for historic and modern entomologist to buck the winter doldrums than to sally forth, nose to the snow, to see which black specks are actually “animated beings”. Fitch named eight species, all of which he believed to be new to science. He has since lost credit for only one of these names, one species apparently having been, unknown to him, named by a predecessor. Camera in hand, we headed off to see how many of these creatures might still be found in the neighborhood. A female Boreus – no wings and equipped with a tail-mounted ovipositer. As one can see in these photos, these are slightly fly-like creatures. However, the wings (in the males) are but comb-toothed spines held above the back. These were new to us, but the first two insects on Dr. Fitch’s list are Boreus nivoriundus and Boreus brumalis; and, indeed, this looks like a fine Boreus. According to Fitch’s descriptions and the pictures available at bugguide, this is Boreus brumalis, what he called the “mid-winter Boreus”, “brumale” apparently being Latin for the winter solstice. Boreus in general have also been called Snow Scorpionflies; in the Northeast only the two species described in the 1847 paper are currently known. They are usually put in the order Mecoptera, which includes the more conventional summer Scorpionflies (somewhat larger creatures that look rather like elephant-nosed, long-winged horseflies). Recent work suggests, however, that they are actually more closely allied to the fleas. Nearby on the snow, coincidentally or not, were scraps of moss. Reading through on-line information, it seems clear that Boreus is “associated” with mosses, but exactly what that association is seems less clear. Suggestions are that adults and larvae feed on the moss itself, but it has also been proposed that either or both stages are predatory. 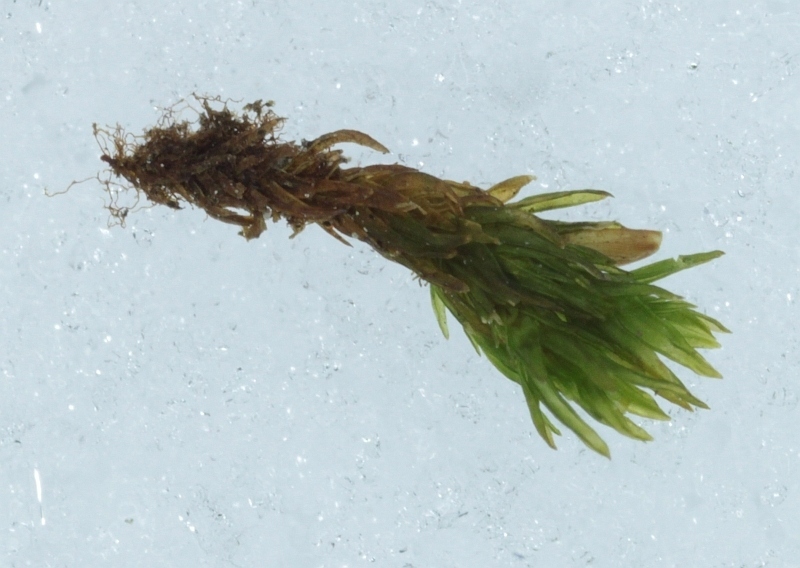 So, if you have some moss-watching time on your hands, here’s a scientific frontier in your backyard. 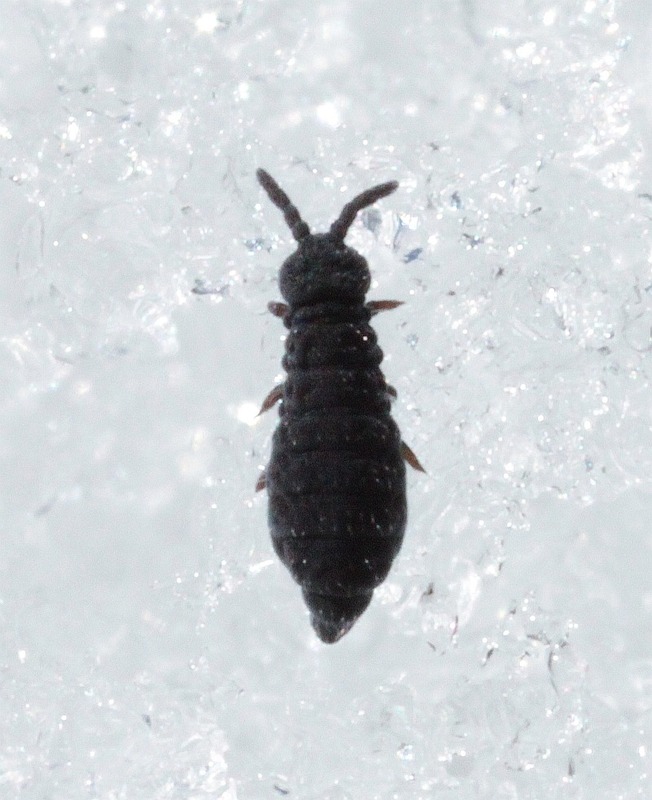 Boreus are also called ‘snow fleas’ a term which, in this country, is usually reserved for the Springtails described below (even if Boreus are the organisms more closely related to true fleas). In any case, these creatures do hop and for more than you ever wanted to know about how these creatures do it (including stop action analysis), see this paper. The next two wintery insects on Fitch’s list are both Stoneflies, critters that he called “The Small Snow-fly” and “The Large Snow-fly or Shad-fly”. As he well knew, these are not true flies, but rather the adults of common, stream-living larvae, well familiar as some of the ‘flies’ of the fly fisher. He named the first Perla nivicola, a name that has since been updated to Allocapnia nivicola; the second, he dubbed Nemoura nivalis, a name now changed to Taeniopteryx nivalis. The ‘nivicola’ and ‘nivalis’ derive from a Latin adjective meaning snowy. 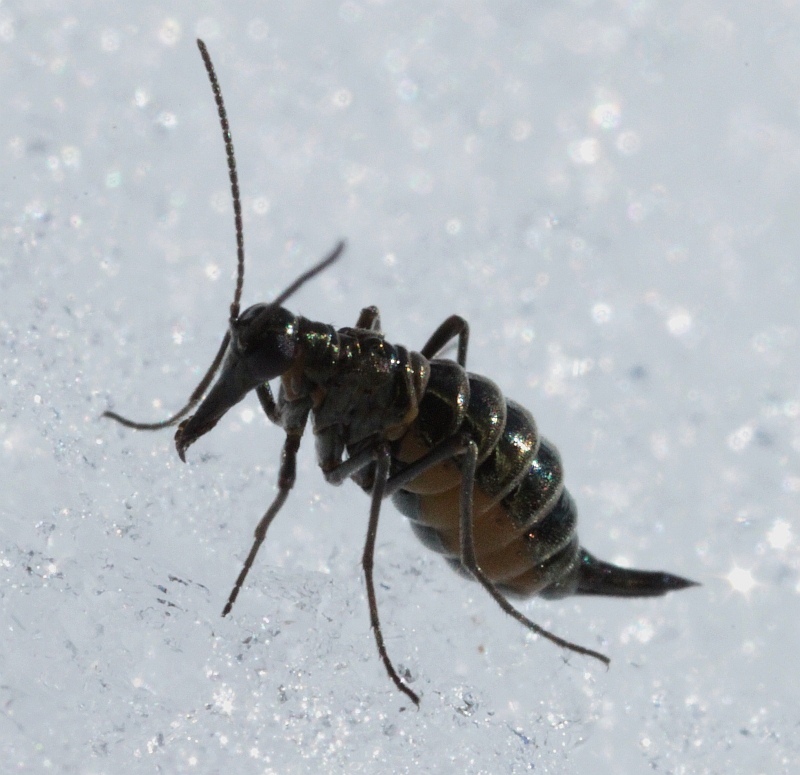 Winter stoneflies are often common around streams during the winter months. They apparently have their life cycles timed so as to emerge in the depths of winter, a timing perhaps selected for because of relatively lower predation pressure. A different flavor of these creatures made a cameo in an earlier blog. 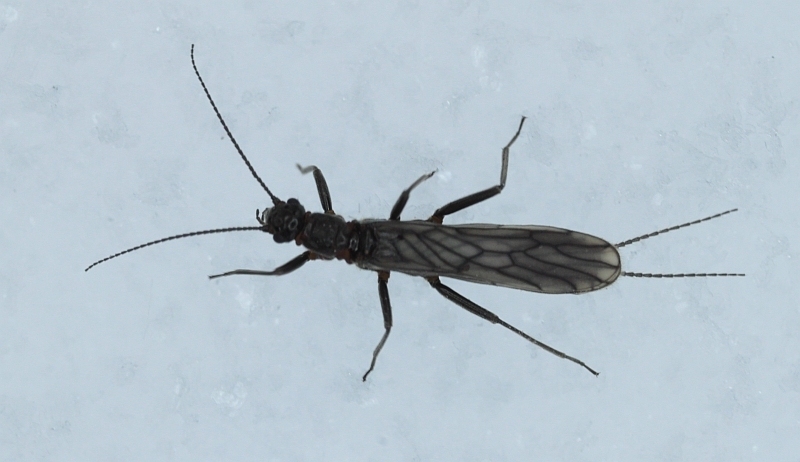 This stonefly more closely resembles Fitch’s little snow-fly than his larger find. Whether it actually is Allocapnia nivicola, I don’t know. 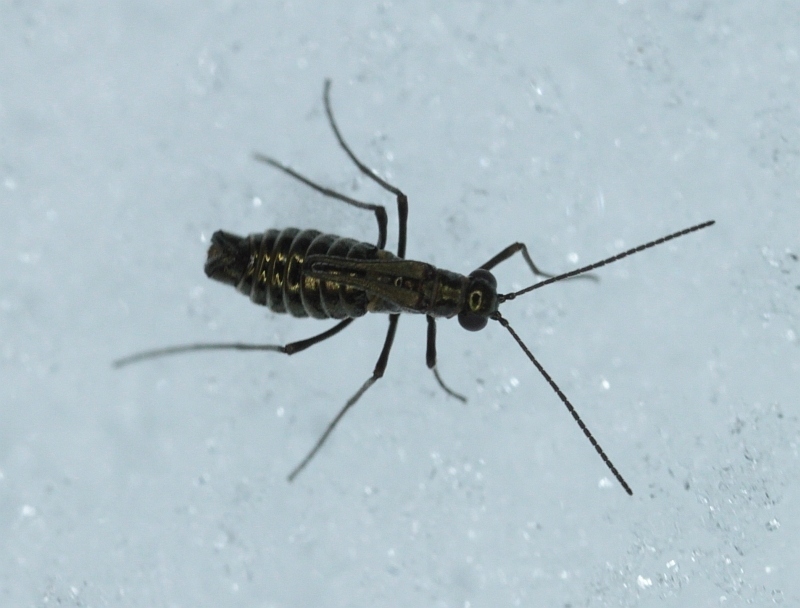 But, as harbingers of clean water, any winter stonefly should be a welcome sight. Next in Fitch’s paper comes Culex hyemalis (now why not spell that “Coolex”?) or what he calls “The Winter Musketoe”. This is a true mosquito and was the only one of Fitch’s ‘discoveries’ to later be revealed as having been previously named by science. So, I won’t worry that we found no representative to photograph. 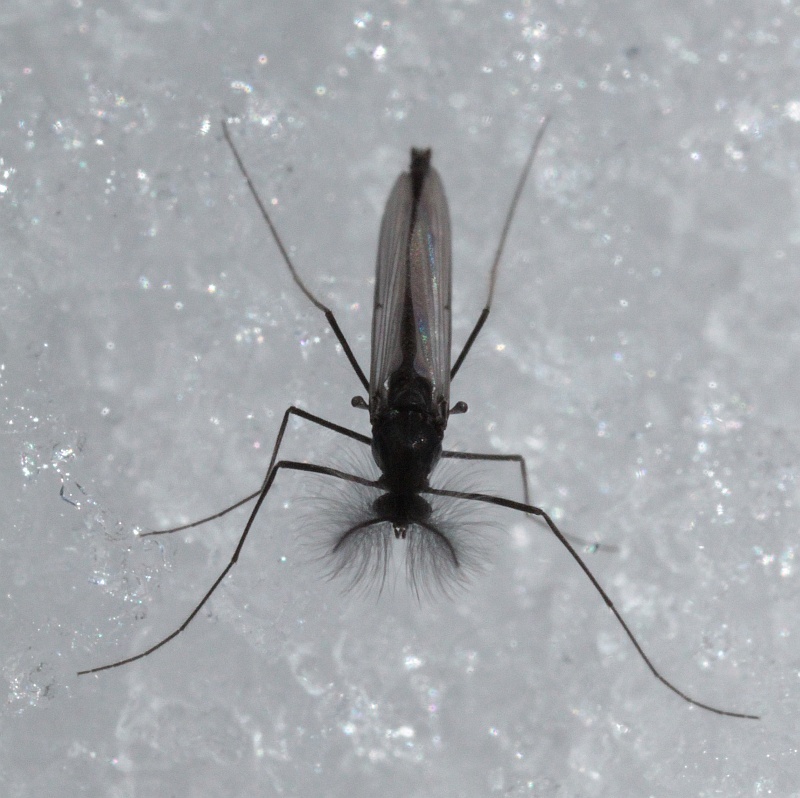 Chironomids are characterized by their mosquito-like bodies and feathery antennae. We came across this candidate. I’m pretty sure this is a female Snow Midge, although I haven’t the foggiest on whether it’s the same species as the male above. 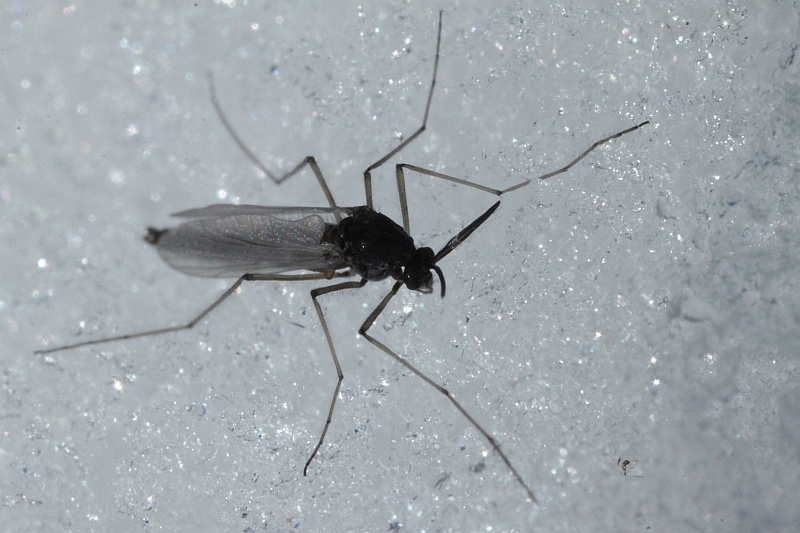 Bugguide says there are at least 30 species of winter-flying midges in our area and that inspection of the genitalia may be needed to distinguish them; so, we’ll leave this at ‘snow midge’ and not claim that it is exactly Fitch’s species. The penultimate appearance in Fitch’s winter presentation is Trichocera brumalis, known today as ….Trichocera brumalis. These are winter Craneflies, Craneflies being those aptly named insects that look like oversized mosquitoes on stilts. Our outings have yet to reveal a photogenic volunteer of this group, so please head on over to bugguide if you want to see what Fitch was talking about. Finally, comes what is perhaps the most familiar winter insects, what we call Snow Fleas, those tiny black specks one sees jumping about on the snow. As Fitch wrote, ” At any time in the winter, whenever a few days of mild weather occur, the surface of the snow, often, over whole acres of woodland, may be found sprinkled more or less thickly with these minute fleas, looking at first sight, as though gunpowder had been there scattered.” Indeed, these are often so numerous that one takes them to be part of the texture of the snow rather than a nearly infinite number of grains of life. Fitch assigned the Latin name Podura nivicola to this species, the ‘nivicola’ has persisted, but not only has the genus now morphed into Hypogastrura, but this group of organisms, the Springtails, are no longer considered insects. Whatever else they are, Snow Fleas are tiny (about 1/16th of an inch). This, together with their ability to jump, makes them seem to disappear and reappear on the snow surface. Snow Fleas jump by flicking a forked, tail-like structure called a furcula. 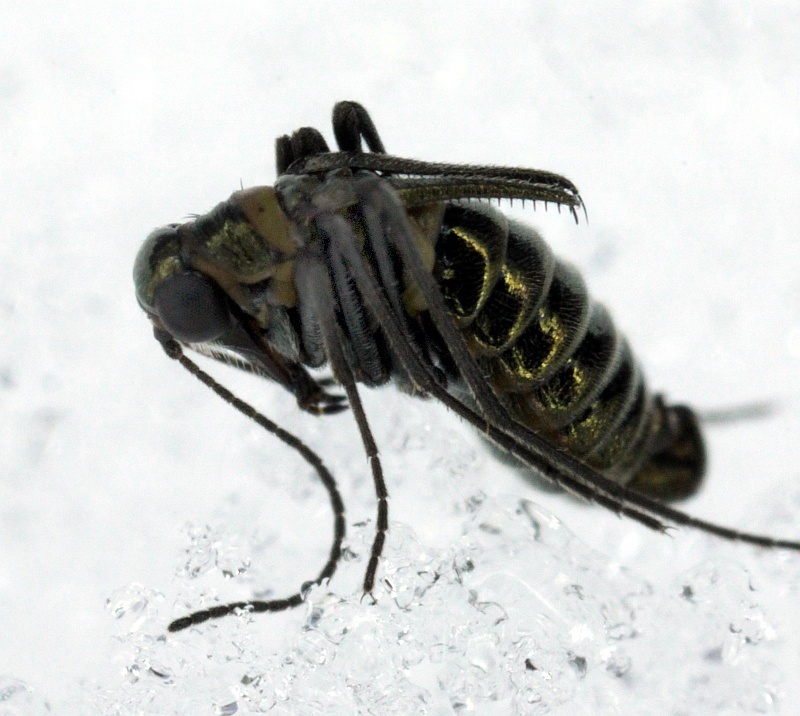 This appears to lock into a belly structure that lets the Snow Flea build up tension before suddenly releasing its spring, in somewhat the same way that you may be accustomed to flicking meatballs with a fly swatter (although, of course, in this case, the meatball stays still and the fly swatter is flicked through the air). We patiently attempted to catch Snow Fleas in the act. The first few seconds of this video from our outing show a Snow Flea clambering over snow with its furcula visible below its tail end; that is followed by four clips of bouncing Snow Fleas. Notice that the Snow Flea seems to prepare itself, shortening its body and extending a set of hair-like fingers from its back end. Snow Fleas, like most Collembola, abound in the soil where, by feeding on dead organic matter, fungi, and microscopic animals, they help grease the wheels of decomposition and re-composition. It’s easy to imagine Asa Fitch trudging across a snowy land, vials in hand, picking up many of the same creatures we can find today. And yet in doing so, some 160 years ago, he came home with pockets full of new species. Surely, such are still to be found in our land, although perhaps not as easily. 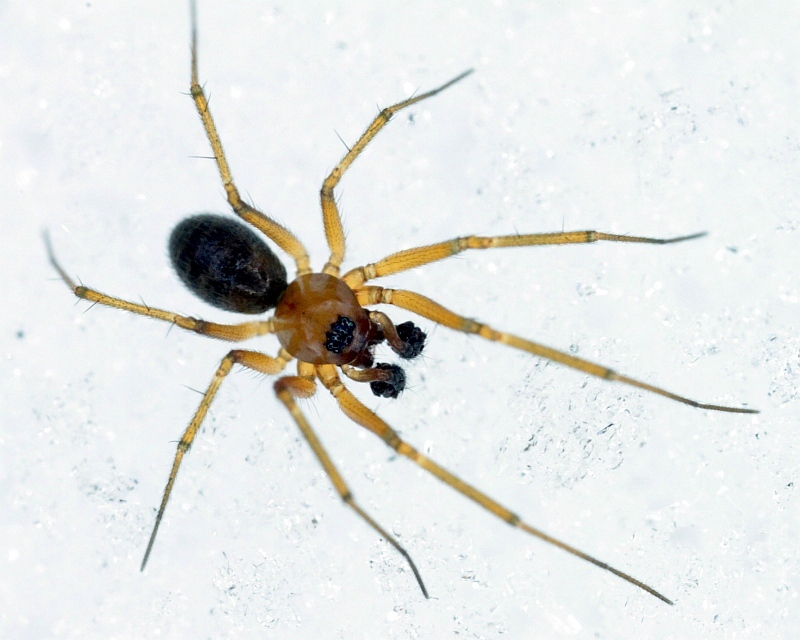 A snow-prowling spider… but that’s another blog.